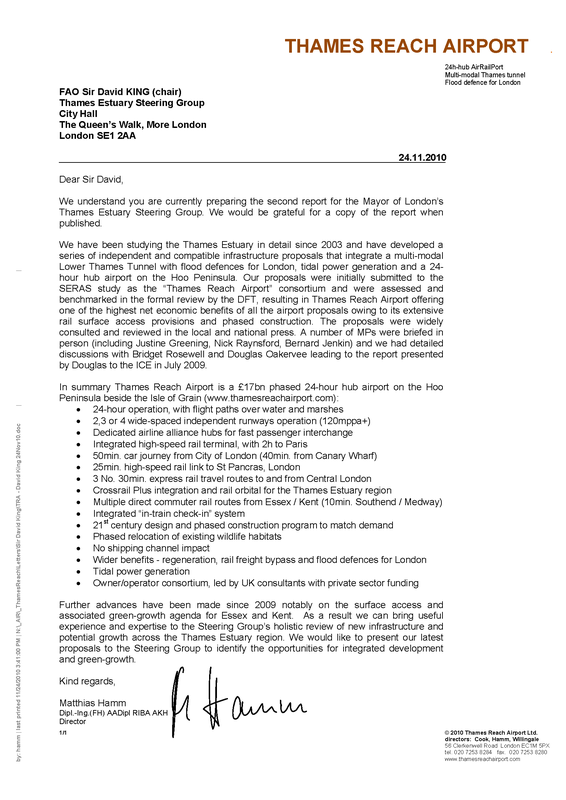 We understand you are currently preparing the second report for the Mayor of London’s Thames Estuary Steering Group. We would be grateful for a copy of the report when published. We have been studying the Thames Estuary in detail since 2003 and have developed a series of independent and compatible infrastructure proposals that integrate a multi-modal Lower Thames Tunnel with flood defences for London, tidal power generation and a 24-hour hub airport on the Hoo Peninsula. 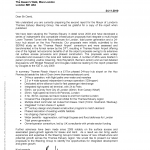 Our proposals were initially submitted to the SERAS study as the “Thames Reach Airport” consortium and were assessed and benchmarked in the formal review by the DFT, resulting in Thames Reach Airport offering one of the highest net economic benefits of all the airport proposals owing to its extensive rail surface access provisions and phased construction. The proposals were widely consulted and reviewed in the local and national press. A number of MPs were briefed in person (including Justine Greening, Nick Raynsford, Bernard Jenkin) and we had detailed discussions with Bridget Rosewell and Douglas Oakervee leading to the report presented by Douglas to the ICE in July 2009. Further advances have been made since 2009 notably on the surface access and associated green-growth agenda for Essex and Kent. As a result we can bring useful experience and expertise to the Steering Group’s holistic review of new infrastructure and potential growth across the Thames Estuary region. We would like to present our latest proposals to the Steering Group to identify the opportunities for integrated development and green-growth.